It seems that rather than ‘help’ the Global South by pushing its inhabitants (probably by means of crippling loans) towards achieving the same standard of living that we have in ‘developed countries’ (and thereby probably ensuring the complete destruction of the biosphere as fit for human habitation), the more optimal path is to enable people in those regions to skip the entire process of industrialisation and jump straight to a mixture of what really works within their own cultures and ways of doing things, with appropriate modern technologies. I saw some of this taking shape in Ladakh, India last year where small solar panels and solar ovens are catching on to take advantage of the abundant summer sun and mitigate the effects of the unreliable (or in some cases non-existent) electricity grid. This was mixed with technologies which have long been used in the area such as compost toilets, as it is a place where water is generally quite scarce. Manufacturing in areas of the developing world that lack electricity severely restricts the technical sophistication of what is produced. More than a billion people with no access to electricity still have access to some imported higher-technologies; however, these often lack customization and often appropriateness for their community. Open source appropriate technology (OSAT) can over­come this challenge, but one of the key impediments to the more rapid development and distri­bution of OSAT is the lack of means of production beyond a specific technical complexity. This study designs and demonstrates the technical viability of two open-source mobile digital manufacturing facilities powered with solar photovoltaics, and capable of printing customizable OSAT in any com­munity with access to sunlight. 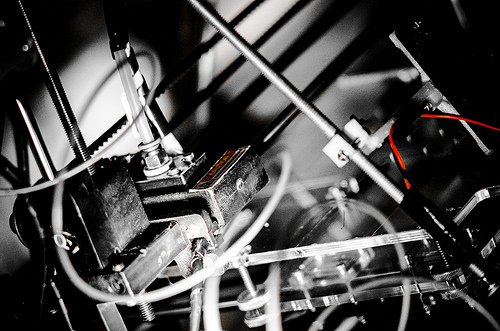 The first, designed for com­munity use, such as in schools or maker­spaces, is semi-mobile and capable of nearly continuous 3-D printing using RepRap technology, while also powering multiple computers. The second design, which can be completely packed into a standard suitcase, allows for specialist travel from community to community to provide the ability to custom manufacture OSAT as needed, anywhere. These designs not only bring the possibility of complex manufacturing and replacement part fabrication to isolated rural communities lacking access to the electric grid, but they also offer the opportunity to leap-frog the entire conventional manufacturing supply chain, while radically reducing both the cost and the environmental impact of products for developing communities. “One of our values at re:3D is to provide 3D printing technologies to communities around the globe, many of whom don’t have the resources we take for granted. Access to plastic feedstock, a consistent power infrastructure, and reliable shipping services have always been a requirement to play in the 3D printing space. We want to change that. One of the microsteps in this direction is to find other ways to power our 3D printer, the Gigabot, while still allowing multi-hour (and sometimes multi-day) prints to emerge from our 600mm X 600mm (2ft X 2 ft) build platform. While I agree, I think this kind of progress requires a lot of infrastructure which can’t be leapfrogged forward. It involves changing the ethos of the country. It’s a long process. Take China for example, only now after losing a 4-5% of their annual GDP to environmental degradation do they finally realize the importance of using more sustainable methods.